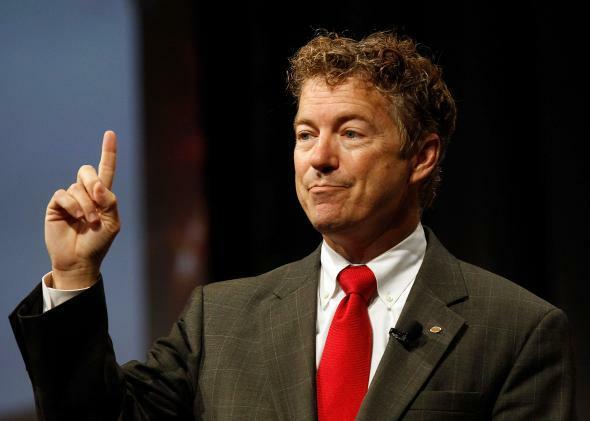 Rand Paul for president: Why the libertarian candidate doesn’t stand a chance in today’s GOP. Republicans aren’t nearly as libertarian as his supporters wish they were. Sen. Rand Paul speaks on Aug. 29, 2014 in Dallas. Rand Paul will not be the next president of the United States. If I’m proven wrong about this, I’m prepared to get a prominent tattoo of Rand Paul taking his place on Mount Rushmore. To understand Paul, you must appreciate that he’s not just thinking about 2016 or 2020, or even about his own political future. He hopes to remake the Republican Party in his libertarian image. Though he might not succeed this time around, his devotees believe that he is in a much stronger position to do so than his cantankerous father, Ron Paul, and they’re not crazy. Rand really is a more appealing messenger than Ron, and it’s at least possible that a libertarian Republican can appeal to younger Americans who are beyond the reach of a more traditional GOP candidate. What libertarian Republicans have so far failed to reckon with, however, is that for every socially liberal voter willing to join the “leave-us-alone coalition,” there are at least one or two other swing voters who will run screaming in the opposite direction. Before we delve into what today’s libertarian visionaries get wrong about the American electorate, it is important to give Rand Paul his due. Even as Rand tries to distance himself from Ron, both men are driven by the same fundamental convictions that led Ron to bolt from the GOP in 1987. Back then, Ron railed against Ronald Reagan for being a “warmed-over Keynesian” and a warmonger who was threatening America’s civil liberties. Indeed, Ron went so far as to run for president as the Libertarian Party candidate in 1988, when he won 430,000 votes just as Reagan’s even squishier vice president romped to a mammoth victory. Ron eventually made his way back into the Republican tent, though you get the distinct impression that he did so reluctantly. For one thing, Ron’s party affiliation never prevented him from denouncing other Republicans for their supposedly socialistic and militaristic ways. Rand has clearly learned from his father’s years in the wilderness. Instead of leading a futile crusade against the GOP mainstream, Rand has chosen to go with a softer touch. When Rand was first elected to the Senate in 2010, it was on the strength of the army of libertarian activists that had coalesced around his father’s 2008 and 2012 presidential campaigns. But from early on, Rand demonstrated that he was his own man. Most prosaically, Rand, like virtually all Republicans of his generation, speaks warmly of Reagan, his father’s bête noire. He has been careful to present himself not just as a conservative Republican, but as a more authentically conservative Republican than his detractors within the party. For example, many on the right have accused Rand of being an isolationist, a charge that stings in large part because his father was a scathing critic of America’s military entanglements around the world. Rather than concede the point, Rand insists that his cautious approach to foreign policy is rooted in Reagan’s “Peace through Strength,” reminding his GOP critics that Reagan was far more reluctant to use force than, say, George W. Bush. He’s even said that he supports military action against ISIS, provided that it’s authorized by Congress and that there is a clear exit strategy. Though Rand hasn’t completely neutralized the isolationism charge, and though we can expect his would-be opponents, led by Florida Sen. Marco Rubio, to challenge him on his dovishness, he certainly doesn’t sound like a peacenik. If anything, foreign policy should be the least of Rand’s concerns. The deeper challenge he faces is that Republicans are not as libertarian as he and his followers seem to believe. Consider taxes, an issue that you’d think would unite the GOP. In March, the Pew Research Center found that 45 percent of Republicans believe many wealthy people don’t pay their fair share of taxes. That’s lower than the 63 percent of independents and the 72 percent of Democrats who expressed the same sentiment, to be sure, but it’s much higher than you’d think if the GOP were a straightforwardly libertarian party. And just in case you think this is a fluke, a new Washington Post–ABC News survey finds that when Republicans were asked if they’d favor a candidate who signed an anti-tax pledge over one who did not, only 26 percent said they’d favor the pledge-signer while 69 percent said that they’d favor the non-pledge-signer. To be fair, libertarianism is about more than just cutting taxes. Some libertarians, like the billionaire political activist David Koch, believe that tax hikes on the rich should be part of a broader effort to reduce future deficits. At the very least, the fact that Republicans, and Americans more broadly, are so open to tax increases should be somewhat discouraging to a libertarian like Rand. If not tax cuts, what exactly is he offering anxious middle-income voters? How will Rand Paul help them climb the economic ladder? If your answer is that he wants to make it easier for you to open a falafel stand without a license, you haven’t thought hard enough about the question. Principled libertarians might scoff at the idea that it’s government’s job to lend families a helping hand. Unfortunately for them, this idea is deeply ingrained in the minds of American voters, and it will take more than a stump speech or two to convince them otherwise. One of Rand’s chief arguments for his electability is that a libertarian Republican who opposes mass surveillance and favors local control over education, health care, marriage, and marijuana can win California and other deep-blue states. This may well be true among tech-savvy libertarian entrepreneurs in Silicon Valley, a group that Rand has assiduously courted. But will it work with ordinary working- and middle-class California voters who opposed Mitt Romney and George W. Bush? Can Rand win over the millions of Californians who depend on the earned-income tax credit, Medicaid, and food stamps by promising to leave them alone? How many Californians, and for that matter how many Americans, vote on issues like fighting Internet censorship, legalizing industrial hemp, and banning drone strikes on U.S. citizens? In case you can’t tell, I’m skeptical. Like it or not, the same voters who will cheer Rand on for backing prison reform and a path to legal status for unauthorized immigrants will recoil from his calls for deep cuts to safety net programs. None of this is to suggest that Rand Paul doesn’t have a valued place in the GOP. Libertarians are the party’s conscience, as they push back against government overreach on every front. Yet the mood of the country is such that a libertarian Republican is unlikely to go very far in 2016. What the GOP needs is a candidate who speaks to the economic aspirations of middle-income voters, not a candidate driven first and foremost by libertarian zeal.